Hallo everyone, I hope you're all fine! The end of January/the beginning of February has been quite hard for us, especially for my little boy. He's been sick for almost three weeks, with so much fever and he felt really bad. When I saw the card that says 'Be. Breathe. Do' I had to think of my son. That's what I told him, when he was so sick and when he was scared that he wouldn't be better ever. I told him to just be and accept it for now. That he is not well, but that he will be better and will be able to smile again. And I am so so glad and happy that he is feeling better now! That was so hard to see. So I decided to capture this (I took the photo when he was feeling much better tho, because I didn't want to bother him too much, of course) and to let him know that it is going to be better. Just be and believe in it. 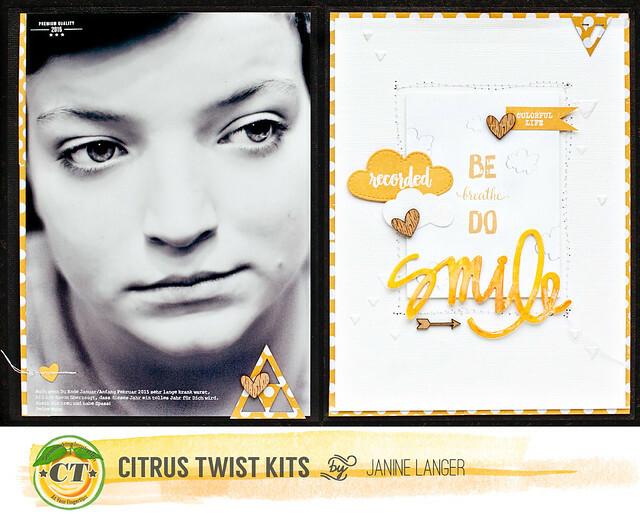 As I wanted the layout to be bright, sunny and positive and I also am in love with the color yellow right now, I just went with the flow. I knew I wanted to create a double pager and so I decided to make each page a 6x8 inch size. 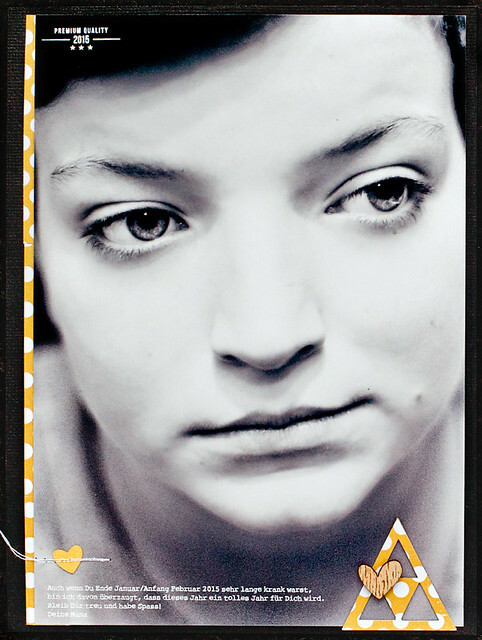 I printed the photo slightly smaller than 6x8, because I wanted to frame it and added the journaling beforehand. Before I printed it though I went through this month's PL kit and saw the 'Premium Quality 2015' saying. It sounds weird at first to incorporate this stamp into a layout that captures my son's bad health at the beginning of the year. But I wanted the meaning of the layout to be positive, I wrote in my journaling that I am sure the year will be much better from now on. So I thought the stamp would fit though. But I wanted to have the stamp itself a tiny bit smaller, because the layout's size is only about 6x8 inch and I didn't want to cover up too much of the photo. So instead of stamping it on the picture, I scanned the words in and turned the saying into a digital stamp that I added on the photo before I printed it. 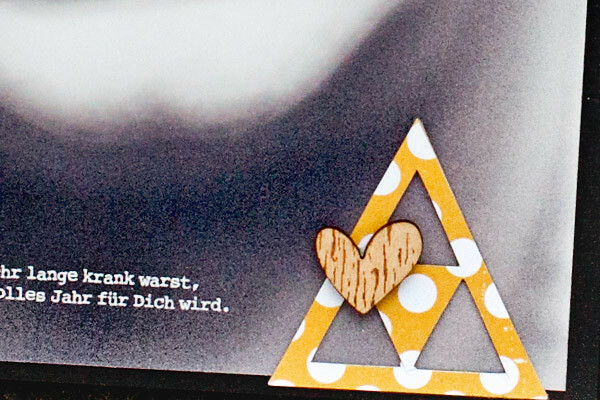 I also wanted to use those adorable kraft triangles, but they were a bit to dark for what I had in mind. So I covered two of them with one of the papers from the paper pad in the kit and cut it out. I then adhered one triangle on the bottom of the photo. I also added one wooden heart, some more patterned paper under the left side of the photo and matted everything on black cardstock from my stash. 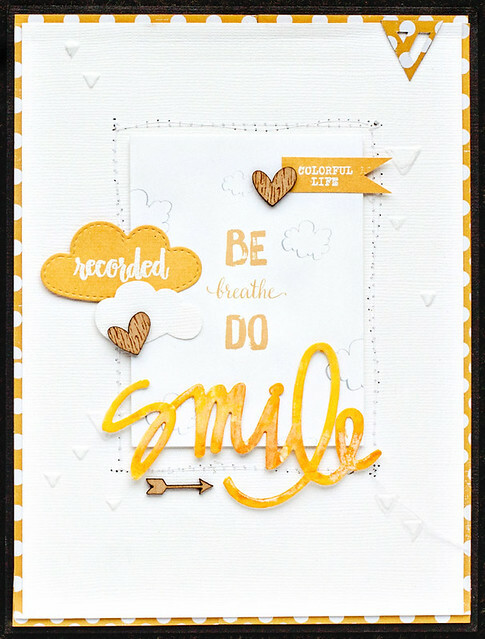 As I already knew there would be a lot going on on the other page of the double layout, I just added one more heart I punched from the yellow cardstock and stitched over it. So the left page was finished quite quickly. I cut a white cardstock from my stash slightly smaller than 6x8 inches, adhered the PL card with thin foam tape on it and stitched around it. After that I wanted to give the background a bit more interest and dimension, so I decided to use a triangle embossing folder from my stash and embossed some triangles on the background. That took some time, I did it by hand, because I didn't want to have the whole background covered in triangles. 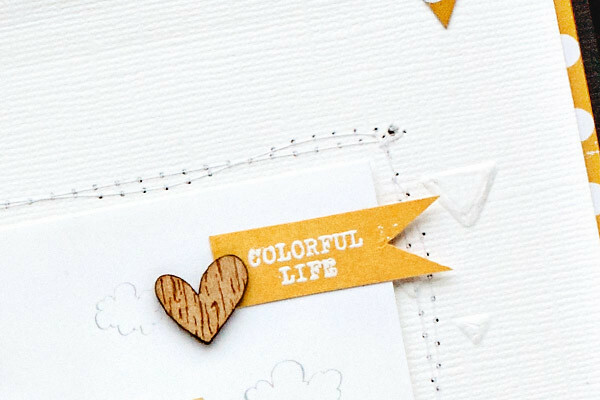 To add another texture and surface I decided then to stamp two sayings from the February 'Colorful Life' stamp set with Versamark embossing ink on yellow cardstock that came with the kit and embossed it with white embossing powder from my stash. I cut one of the sayings into a little banner and the other one into a cloud. As well as another cloud cut out of the white cardstock that I used for my background. 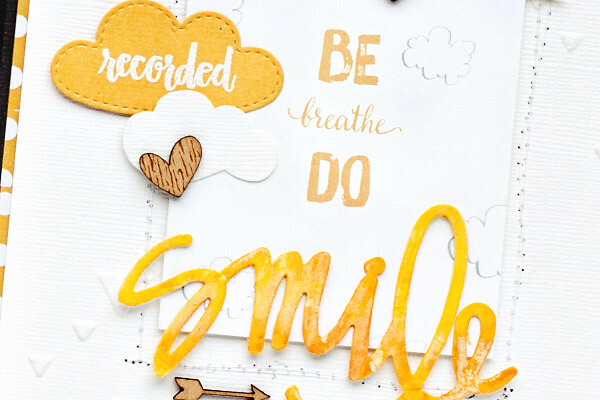 When I saw the watercolor paper words in the kit, I knew I wanted to use the smile one also for this layout. So I colored it with two different Gelatos from my stash to add another surface and texture on the layout. Finally I adhered everything, added some more wooden hearts, the other triangle that I covered with patterned paper and adhered some more patterned paper under the white cardstock before I adhered it on another piece of black cardstock from my stash. Thanks for taking the time to stop by and have a wonderful day everyone!